Interesting marriage traditions in the world. Would you like to learn regarding wedding preparation in the world? How bride and groom alike in your situation need to experience. And be sure they have as interesting wedding customs as we have. If you are interested let get started. Wedding traditions are influenced by such factors as culture, religion, political situation and all these create big differences. Perhaps some people may not believe when will read these customs. In actual fact all these customs in the world were created with intention to give reliable basis for marriage. Let’s have a look to marriage traditions of other countries that are different from one to another. Because of caste and colonialism being in the past together with religious traditions, Indian wedding traditions become varied. These weddings consist of three parts. The first sectionincludes of wedding preparation and fiancée parties arranged before wedding. During these parties bride meet with groom’s relatives. Like in Turkish henna nights, on these occasions hands and feet of bride are colored with so called “mehndi” henna in accompaniment of Indian music and dances. The second part consist of weddings days arranged by groom’s mother in low. On wedding day after washing fiancé’s feet, he is offered honey and milk. The special garment called “sari” is provided by bridegroom for bride to wear on wedding day. Indian brides, who are loyal to their traditions, do not wear white wedding gowns instead they prefer this garment elaborately draped around their body with many fine work on it. The third part of wedding includes fire dance with bride and groom. Around this holy fire, burned on wedding, fiancé and fiancée need to turn in circle four times and run to their table. According to Indian beliefs, who was first coming to the table will lead the family. Astrology is one of the procedures taken into consideration in Chinese wedding customs. Male side relatives ask fortune teller, whether couple will have happy marriage. Astrologer prepare horoscope for groom’s family. If this predictions will be accepted by groom’s side, they send it to bride’s family and will ask to do the same. Before wedding day gifts are sent to bride family and tee has very important value among them. During the wedding bride was wearing red colored dress, red shoe, and covered by a red head- kerchief. Red color is believed to be a sign of fortune and happiness. Nowadays it can also be seen brides with white skirt. When bide leaves parental home, she cries to show her affiliation with family. Arrival of bride to groom’s home starts wedding ceremony. According to Chinese marriage traditions before the wedding day groom prepares marriage bed by decorating with oranges, different fruits, and nuts. Babies and small children of family sit down on this bed; in the belief that the more children will be on the bed the more fertility will have bride. Bridesmaids are selected according tocompatibility withbride’s horoscope birthday. Wedding traditions also includes faithfulness ceremony to each other, to heaven, to soil, to mother and father. When couple has its first wedding night, they cut small pieces of their hair and keep them as memory forever. Due to belief in China last 15 day of 7th month hell’s doors are opening and lost spirits moving around, therefore marrying during these days will bring bad luck. of continent groom candidates after making proposal to the bride’s family, and in case of acceptance this proposal, give them money and peanut. Bride candidate first shares peanut with groom and them gives it to other persons who was helping themto find each other. At the same time it means wedding invitation for relatives, neighbors, and friends. Like in past slavery times on wedding day bride and groom jump over besom. The meaning of thiscustom is that couple will leave all badness behind and start new life. On African’s modern wedding ceremonies,in order to honor their ancestors, bride and groom keep jumping over besom decorated with tulle and ribbon. In Russia bride and groom on the marriage ceremony, in contrast to us, wear wedding ringon right hand ring finger. If someone wears wedding ring on left hand it means that she/he is divorced or lost his/her spouse. Wedding loaf is one of the interesting Russians traditional ritual.This special marriage loaf is baked by woman who has happy marriage and many children; and it is decorated with snowball tree which symbolizes love. On wedding day bride and groom bite piece of loaf and whose biting was the biggest one is accepted as Chief of the family. One of the interesting marriage customs Russians have is when groom comes with his friends to the bride’s home, bride’s girlfriends close the entrance injoke and ask for the money to come in. Besides this on wedding Russian groom need to undertake some enjoyable tests. On these tests groom need to confess in front of all guests his love to the bride, and also show performances like dancing or singing a song. In Germany on wedding ceremony guests strew rice on groom and bride which symbolize blessing. It is believed that rice grain amount left on head of bride will determine number of children couple will have. At the end of the ceremony bride and groom cut a log. It means that couple will cope with all difficulties together in their marriage. In Italy people have opinion that marrying on Sundays will bring luck. They also have interesting ritual when bride and groom come to chapel to make a knot. In South Italy guests are expected to dance on wedding ceremony traditional The Tarantella. In this way people believe that new couple will live on the fat of the land.Bed for bride and groom prepare two unmarried girls before wedding. Bosna and Herzegovina wedding traditions. In Bosna and Herzegovina groom candidate who wants the girls are invited to dinner by girls relatives and make conversation regarding marriage. When grandparents’ of the girl come to the decision about groom candidate, coffee is offered. If coffee with sugar is given to groom candidate it means his proposal was accepted. But if coffee was offered to him without sugar then he was denied as groom. In Pakistan groom candidate need to pass tough test organized by girl’s relatives. This test consist of saying to the groom candidate all possible insults and swear words by girl relatives and he need to overcome it calm. If candidate pass this test successfully he gets permission for marriage. Scotland is the country there are many interesting wedding traditions. Before wedding day eggs mixed with tomato paste or similar food dump out on the bride. From head to feet being in this mixture bride walk around the city so that everyone can see it. The purpose of this custom organized by relatives is to prepare her to all hard and bad conditions that might in marriage. Also in Scotland, the country of Christianity, bride and groom on wedding day wash each other feet.This custom symbolize modesty and we can see it in nowadays wedding organization. In Korean wedding customs duck and goose have important value. In the past groom had carried goose at the back on white gold and then went to the bride home. Nowadays symbolic wooden goose is used. According to another custom after the wedding two wooden ducks are placed into couple’s home. If ducks are placed facing to each other that means couple will get along well. And if ducks are placed reverse side to each other it is believed that bride and groom will fight. In Belgium one of the most important wedding custom is to embroider handkerchief. Family of the bride shows embroidered handkerchief with their daughter’s name to the guests on wedding. Afterward bride carries this handkerchief throughout the wedding. After wedding bride family bring back home this handkerchief. And if they have one more unmarried daughter her name is also embroidered on it, if not the handkerchief will be given to future bride’s daughter. Finn brides on the wedding wear handmade gold crown. After wedding ceremony bride chooses one of the girls gathered around her and gives gold crown to the selected girl. It is believed that selected girl will marry soon. On the other hand one of the Finn’s wedding traditions in past was marriages made in the auction way. Groom candidate was giving a price for the bride candidate to her father and then they bargained regarding this price. Specified amount of money was used for dowry. In addition father was wearing silver on bride’s right leg and mother was wearing gold on the left leg; it was done to avoid deficiency of gold and silver in the marriage. Bride and groom after visiting wedding ceremony planner ring the bell to protect marriage from bad spirits. Furthermore on wedding ceremony invited guests throw flowers on bride and groom so couple will have happy family. In France flowers used for the decoration on the wedding are brought by invited guest. Among all other customs in this country is the one where bride and groom drink vine on wedding ceremony from marriage vessel that passes from generation to generation. In Israel according to Jewish belief on weddings itis stepped on cloth filled with pine pieces symbolizing disappearance of Jerusalem’s temple. On ceremony braking pine represents happiness and sadness of the life. In Bulgaria when boy want to make a proposal to her loved girl, he goes with his friend to her home bringing with whiskey called “rakia” and small bouquet of flowers named “zdravet”. Whiskey “rakia” represents happiness, health, andwealth. In addition to these groom candidate also bring small gifts to girl and her father. After serving drinks to the guests if groom candidate was approved by girl’s father, he asks to his daughter tree times whether she is ready to marry. In case of answer “yes” presents also will be sent to the boy family. On the Thursday before the wedding special bread is baked made of the yeast and dough which represents formation of the new family. On the wedding day bride throws backwards over her head a plate with change, raw eggs and wheat without looking at it. According to the custom the more into the small pieces plate will be broken the better will be marriage. Wedding tradition in the Philippines. In the Philippines about 80% of the population is catholic and therefore wedding ceremony is held flashy in the church. During these ceremonies rituals are conducted with respect to catholic religion. This celebration represents an attempt to make a couple from single individuals. One the ceremony one end of the bride’s veil is held by girl’s father and another end is put on the groom’s shoulder. This ritual symbolizes that bride and groom will protect each other for life long and be will have strong health. One thing more for your information Philippines is the country where divorces can be allowed only by Vatican. 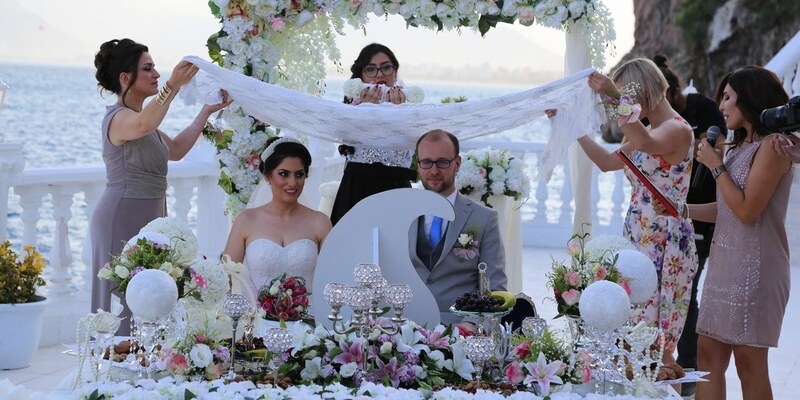 Wedding traditions in the Turkey is also as interesting as those in the rest of the world. For example in Adana when groom candidate goes to henna night he will be stopped on the way and asked to hit eggs on the high tree branch. If he will fail to hit eggs girl’s site will punish him. In response to this punishment boy’s side will steal a pillow from dowry before it delivered to the groom home. For that young boys from girl side will chase groom. Who will manage to take the pillow from groom will become tip for that. In Afyonkarahisar when it comes to ask a family to give their daughter as a bride, boy’s side is served only water. If proposal is accepted then groom’s family is invited on Friday for a tee. In Aydin when groom welcomes bride he strews money, wheat, rice and candies. In Diyarbakir there is a custom to brake earthenware water jag called “testi”. Bride brakes full “testi” in front of groom’s house in order marriage goes lifelong well. In Sanliurfa jewelry ceremony is extraordinary taking place at the end of the wedding day. If there are some friends and relatives who could not come to wedding or make a gold gift to the couple on ceremony, they can come on so called “bride’s Fridays” which last three weeks after weddings and make their presents.